Memories of TOPPS Wacky Packages! Last week our President spoke to the Nation via his annual State of the Union Address. Like all such speeches, the tone was hopeful as the country was informed that its economic malaise was starting to improve. I certainly hope this is the case though, currently, there seems to be a clear divide between rhetoric and reality. One has only to drive down the main street of my own town of Homewood, Illinois and stare at the empty buildings that once housed various stores and small businesses to see this contrast. Having also grown up in this town, later to return and raise my own family, this is not something I am entirely unfamiliar with as it has been over twenty years since I lost the local store that I loved the most. 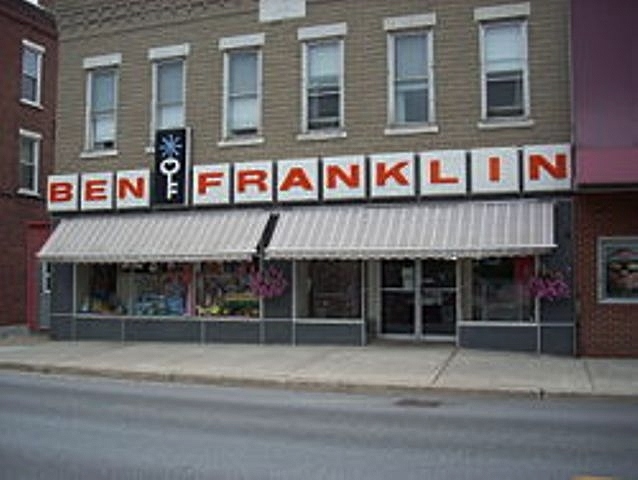 Back in the 1970’s, during my grade school years, the favored store among us kids was “Ben Franklin.” To my friends and I, however, it was commonly referred to as “the dime store.” This was far from a misleading nickname as you could literally walk into the store with a paltry ten cents and leave with a bag full of candy. It was not, however, a sweet tooth that motivated my frequent trips (four blocks from my home on foot) to this childhood fantasia. 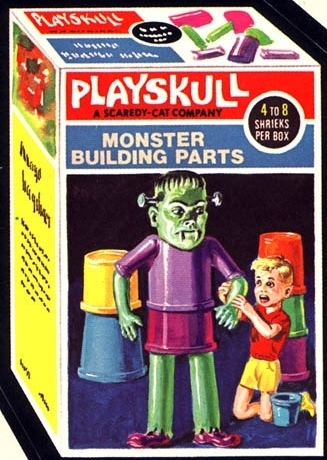 Aside from various candies and treats, they also sold other fun items like the little man with the plastic parachute, rubber creepy crawlies, and collector cards. It was this section of the store that I was most interested in. By-passing the various sports cards, I’d rush to grab a pack or two of my favorite cards of all – TOPPS Wacky Packages! 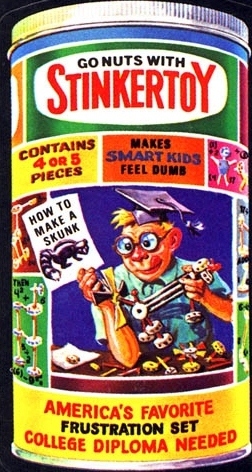 These sticker cards, which made their debut in the late 1960’s, featured parodies of popular consumer products of the day. 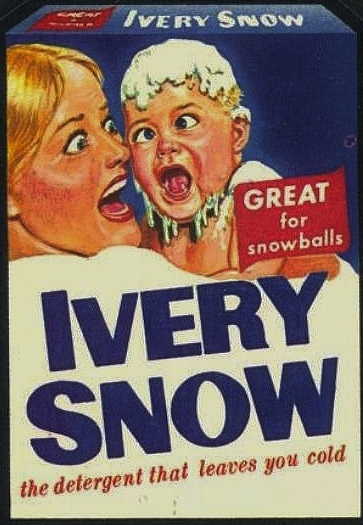 Aside from being quite funny, Wacky Packages (or Wacky Packs as we called them) also featured great illustrations that were surprisingly detailed for being a product geared towards kids. It was always amusing to see a mock version of the various items mom had in her cupboard or what you’d see on the shelves during an otherwise dull visit to the grocery store. I confess that many of the goofy names christened by Wacky Packs, and of which I was well versed at age ten, still stick with me at age forty. 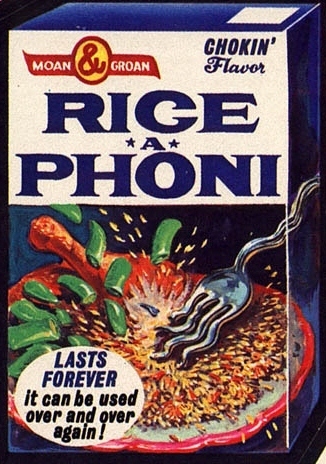 It’s not uncommon for me to ask my own children to be sure and put away their “Stinker-Toys” or ask my wife if she’ll be serving “Rice A Phony” with dinner that night. While these cards were quite popular with many of my fellow classmates, they were even more enticing to monster fans! 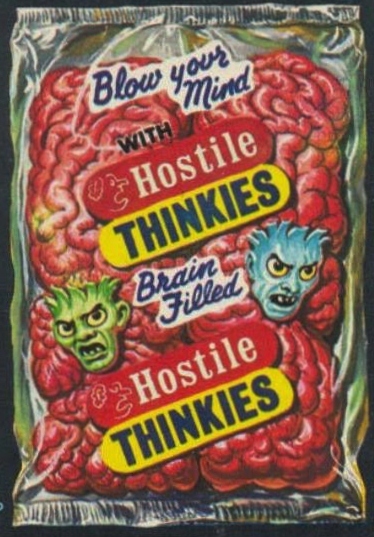 Many Wacky Packs not only parodied a product but, on occasion, gave it a monstrous twist. These illustrations were lurid and even “pulpy” with gruesome images I simply couldn’t get enough of. Ghouls, vampires, witches, and even Universal Studios monsters made a welcome appearance on these cards! 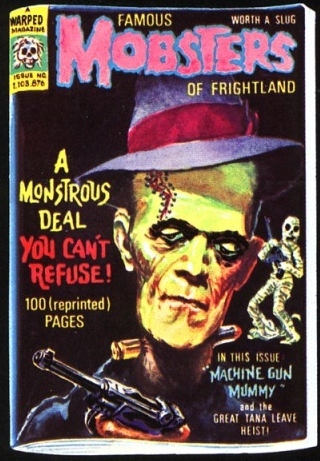 Not having access to many monster magazines growing up, it was Wacky Packs to the rescue! Asking my third grade teacher to staple a few pages of construction paper together, I decided to use the stickers to help create my own. 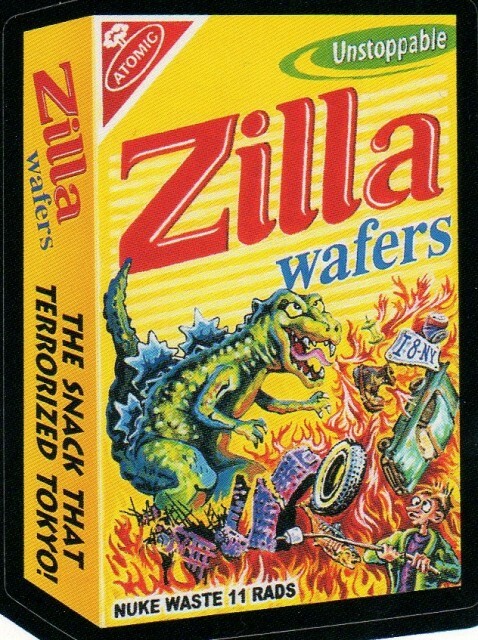 On the front of my book, I colored a picture of GODZILLA and wrote “David’s Monsters.”The inside contained any and all Wacky Packs I could find with a creature, or horror-like theme. Duplicates were welcome as I remember having a full page dedicated to the SCARY LEE (Sara Lee) card alone. Much to my parent’s dismay, not all my Wacky Pack stickers made their way into a designated book. Many ended up on the headboard of my twin bed and my co-blogger, David, surprised me recently by stating he also decorated his bed with Wacky Packs. Clearly these cards were as much a part of his New England childhood as they were mine in the Midwest. 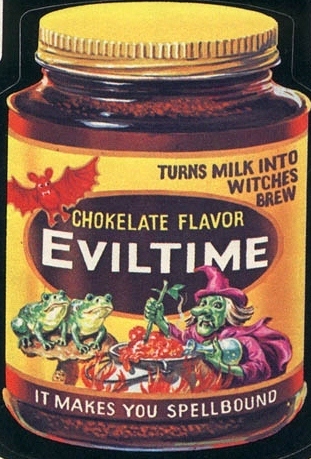 One thing us Chicago fans did have, however, was a horror host who embodied the very essence of Wacky Packages. At the height of “Wacky Pack mania” our local horror host, Son of Svengoolie, periodically presented humorous song parodies and mock commercials. To my friends and I, it was as if our beloved Wacky Packs had their own “live-action” counterparts. 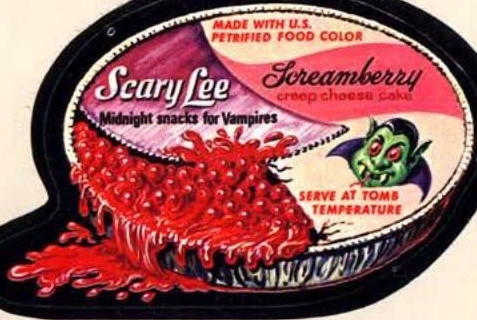 Today you can still find Wacky Packages, which have made a few comebacks over the years. These new cards have been fully modernized for a new generation of children while still retaining their cleverness. They also contain the occasional monster appearance, including a homage to GODZILLA, himself, the very monster that graced the cover of “David’s Monsters” book 30 years earlier. While I’m not as thrilled with the less vintage style illustrations, they still manage to bring a smile to my face. If you are interested in finding the new sticker cards, don’t bother seeing out a local “dime store.” Sadly, they no longer exist in today’s world. You’re best chance is to seek them out at your nearest corporate chain, at $2.00 a pack (or “twenty bags of candy” from the perspective of a 1970’s child at Ben Franklin). On occasion I’ll grab a pack and share them with my own kids who also enjoy them. Unfortunately, with the price of groceries, gas, and overall living going up and up I can’t always justify the extra expense. Then again, perhaps there is no better time in seeking out a good laugh. This entry was posted in Vintage Toys! 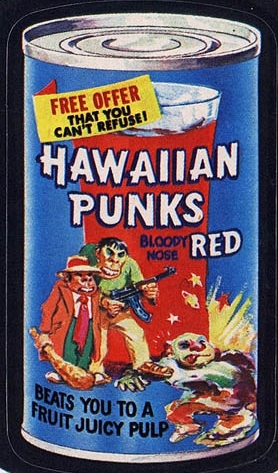 and tagged Ben Franklin, Dine Store, Monster Cards, Son of Svengoolie, Wacky Packages. Bookmark the permalink. ← Adam Green’s Hatchet II: Are Two HATCHETS Better than One? Great post Daves! Wacky Packs were the best growing up. There was nothing better than heading over the the 7-11 with a quarter or two for some Wackys. Except the day we went to the 7-11 to pick up some Wackys and our 3D glasses for the big Svengoolie Creature from the Black Lagoon special. Now that was the greatest day a kid could hope for. Thanks bringing back the memories! they were pretty cool, I still have about 40 or 50 of them that I really would like to get rid of. I have kept them in sleeves all this time along with trucking cards , funny baseball stickers, and many others.